Upcycling materials that would normally be thrown out or even sent to the thrift shop always makes me feel good. Today’s project is no exception. 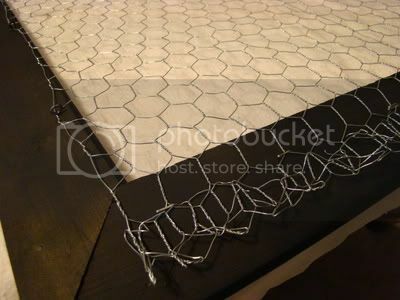 After viewing Marion Smith’s video of her new scraproom, I KNEW I had to have a chicken wire inspiration board of my very own. I have been keeping watch over a couple of different thrift stores for several months now, but this past week I realized that I need not look any farther than my own home. 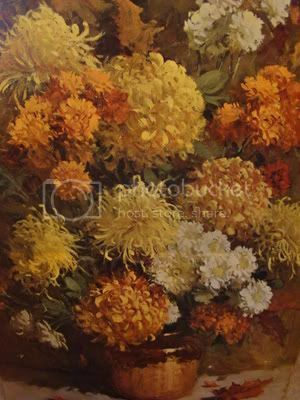 We had a large framed print that had been displayed in my dear, sweet mother-in-law’s house for several years, just leaning against a wall in a spare room at her house. We had taken all the wall decorations down when we painted the house and are now slowly trying to add pieces back to the walls, as we add our own “flair”. I LOVED this print. Unfortunately it was very dated and damaged a bit, but yet I just could NOT throw it away. I guess I was waiting for it to “speak to me”. 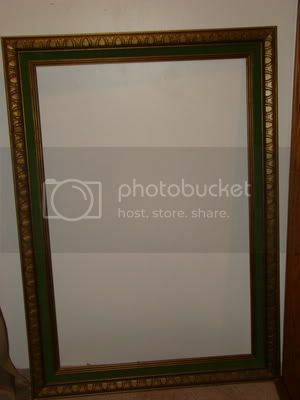 The warped print removed from the frame…. 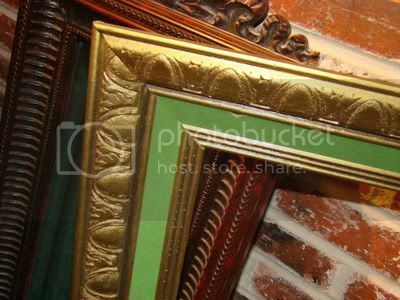 I have always loved egg and dart or egg and tongue crown moulding and this frame had a variation of the egg pattern in the outer portion of the frame. So, on my birthday, My Hero took me to our local hardware store and we picked up the items needed to complete this project. He is so much better at managing the spray paint can than I am and I very gladly handed over that leg of the project to him. Originally, my plan was to cover the entire frame with a light wash of black, but when we discovered the flocking was going to be problematic we had to paint over it completely. 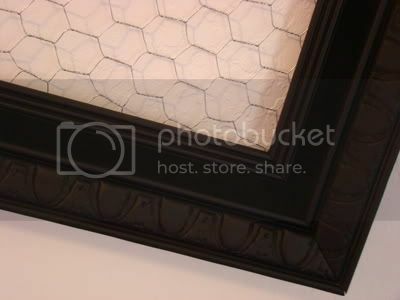 After painting the entire frame, we waited a bit before attaching the chicken wire to the reverse side of the frame. My handy-dandy electric staple gun was very efficient while stretching and pulling at the same time as attaching the wire. The ends were bent back to prevent getting jabbed by the sharp wires. The next step was to crackle paint the front with a scrafty rendition of homemade crackle paint. After a few practice runs on the reverse side of the frame, I decided that I prefered the the black over the cream….so I sealed it with a light coat of glaze and called it good. I hope you will check back soon to see a full sized photo with a few embellisments added. 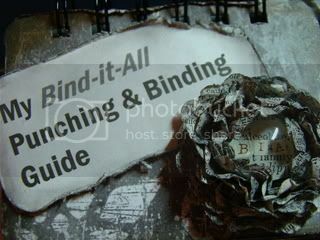 In the meantime, check out Marion’s scraproom tour and see what influenced my very own chicken wire inspiration board. 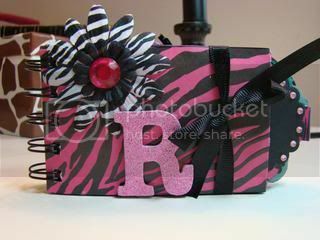 As I am finishing up my Bind-it-All classes at My Creative Classroom, I enjoyed making this little Toilet Paper Roll Mini Album for an eleven year girl that I just met. The paper came from The Paper Studio Safari Untamed Stack. Both of my girls loved pink, purple and zebra print growing up, so I am hoping this young lady does as well. Her family makes it habit to recycle and upcycle, so this makes a perfect gift for her.